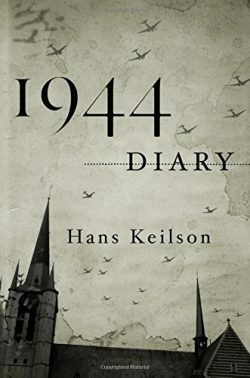 Damion Searls talks about his translation of 1944 Diary by the late German/Dutch writer Hans Keilson. It’s the first nonfiction work of Keilson’s that Searls has translated. We also air most of our 2010 interview with Damion Searls about his translation of Keilson’s acclaimed novel, Comedy in a Minor Key. We all know the story of Anne Frank, betrayed from her hiding place in Amsterdam in 1944 and sent to her death in Bergen Belsen. But there were many German Jews in hiding in the Netherlands who survived the war. One was writer and child psychologist Hans Keilson, who died at the age of 103 in 2011. (Francesca met Keilson in 2003 through his wife Marita Keilson Lauritz when she was in the Netherlands looking into her father’s wartime history.) He went into hiding in Delft and lived to the ripe old age of 101, passing away in 2011. We first spoke here about Hans Keilson in 2010 when his translator Damion Searls came on the show to talk about Keilson’s novel Comedy in a Minor Key. Searls’ translation won numerous awards and was a National Book Critics Circle Award finalist. After the success of that book, Hans Keilson found his 1944 diary, which had lain in a drawer for nearly six decades. It is a remarkable document that illumines his determination to remain focussed on his humanity and his creativity under the most precarious conditions of existence. Damion Searls is an award-winning translator from German, Norwegian, French, and Dutch and a writer in English. He is the author of a book on Hermann Rorschach and the Rorschach test, and has translated many classic modern writers, including Proust, Rilke, Nietzsche, Walser, Ingeborg Bachmann, Alfred Döblin, Jon Fosse, Elfriede Jelinek, and Nescio, edited a new abridged edition of Thoreau’s Journal, and produced a lost work of Melville’s.